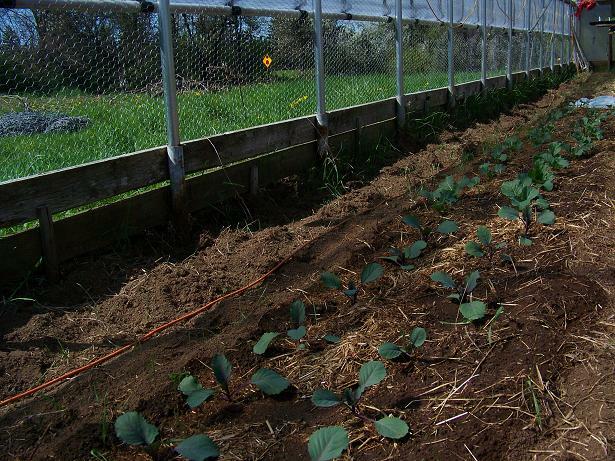 dding a greenhouse to the garden mix requires a little more management than a regular garden. Our greenhouses are unheated, so the nighttime temperatures are about the same as outside. So that means covering tender starts or providing a little bottom heat in addition to the covers on these frosty nights. That’s pretty easy peasy. Keeping the plants cool enough is more of a chore on most days. 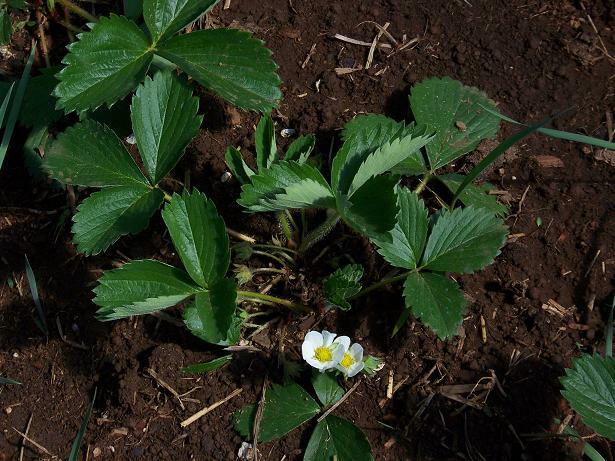 Cloudy days are not a problem, but days like yesterday when the mercury reached 70°F outside, quickly become worrisome to baby plants, and cool weather crops we have planted for our inside garden. 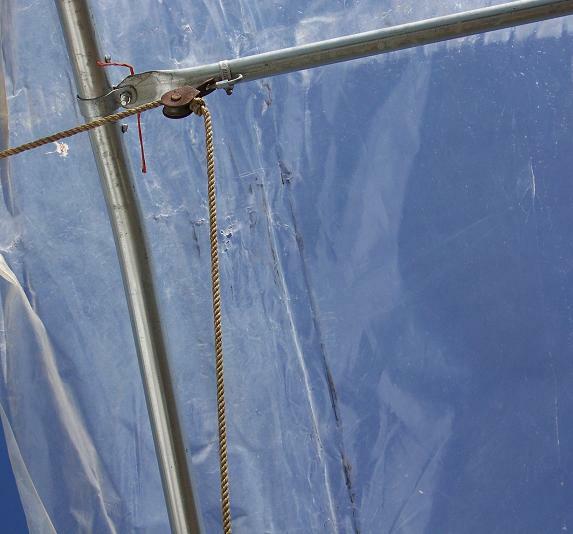 We solved a lot of the heating problems by orienting our greenhouses on a north/south axis instead of east/west. I’m growing plants in these houses during the growing season, so I want as much sun as I can get and not oppressive heat. Winter heat collection is not what I’m looking for. If you want a winter greenhouse, orient your building east/west. This a subject fraught with much heated discussion in growing circles…it really makes no difference to me how someone else orients their greenhouses, I’ll stick with my method as it works for me. Any greenhouse is better than none, IMHO, and gives a gardener more opportunities to grow food. Here is a nice diagram from The New Garden Encyclopedia: Victory Garden Edition (1943.) It explains the north/south axis for the growing season. 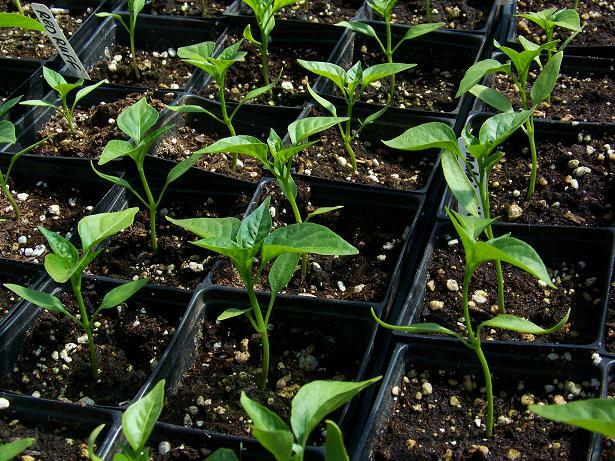 With proper ventilation we can safely grow plants that like cooler temperatures as well as heat loving crops like tomatoes, peppers and melons in our greenhouses. I could grow these crops outside, but I can never be sure if we will get the weather to ripen enough to tomatoes to preserve or eat anything but green tomatoes and peppers. I’ve probably mentioned this before, but growing up here in the Cascade foothills, as a kid I had never seen a ripe or colored pepper come out of anyone’s garden. All peppers were green 🙂 I love green peppers, but ripe is wonderful. 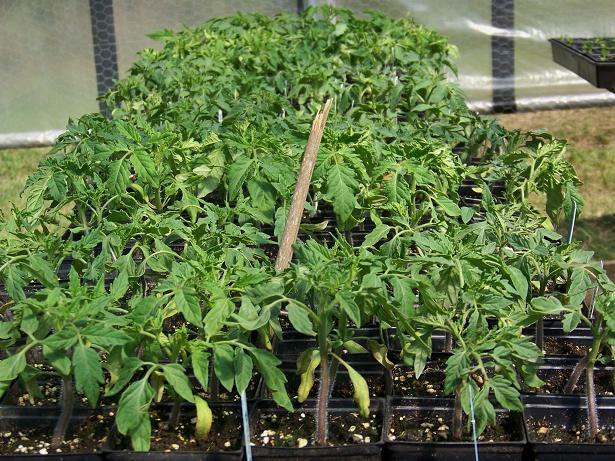 Disease and insect pressure is a consideration too, I don’t have to worry about late blight ruining a whole summer’s worth of work with my tomatoes. Some years we get an outside tomato year, many years we don’t. Also having a well-ventilated hoophouse doesn’t allow too many pests to set up shop. Of course, we get the garden variety pests like root maggots, flea beetles and cabbage moths, but they’re outside too, so I expect that. Hot air rises, so gable vents on each end allow the heat to dissipate without needing electricity for a fan to move the air. Air circulation is huge with plants. 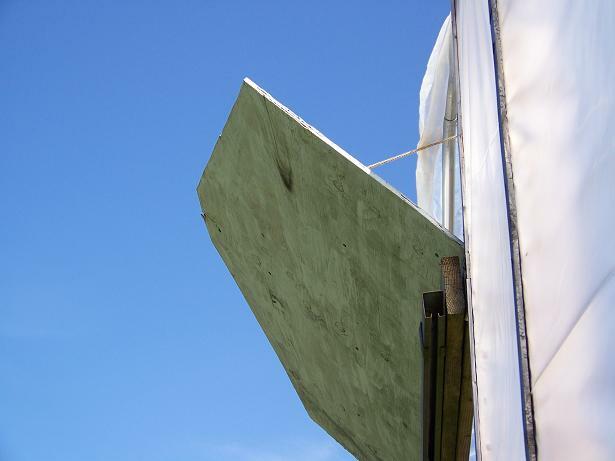 Our greenhouses also have roll-up sides which work perfect for good air circulation. These photos were from yesterday, sides partway up to allow for some cooling , but not too much in order to keep the warm weather plant starts happy. I can roll up one side, both sides, just a few inches, or up to the hip board on really hot days. As with all things gardening, the weather dictates what you will do. Low tech predator control is great too. Deer and rabbits love to get in the greenhouse. With chicken wire on the sides, we can open the house up for ventilation while keeping the personnel doors closed to keep varmints out. 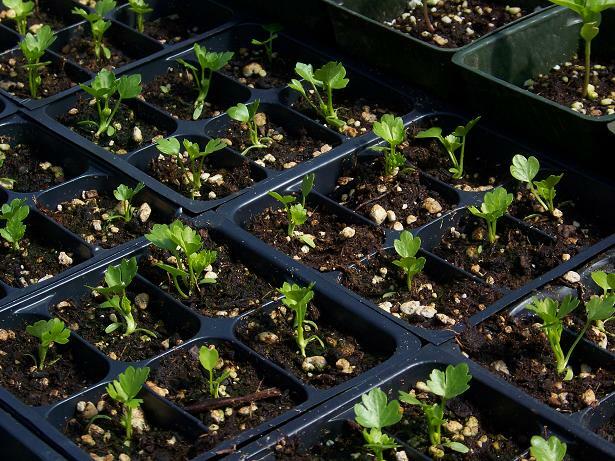 Keep in mind when planning your greenhouse, your bells and whistles may be different than ours. My main job is growing and preserving our food, so I am home and able to pay close attention to our greenhouse needs. These ideas may not work for you, but low-tech solutions can be a money saver when designing your greenhouse. 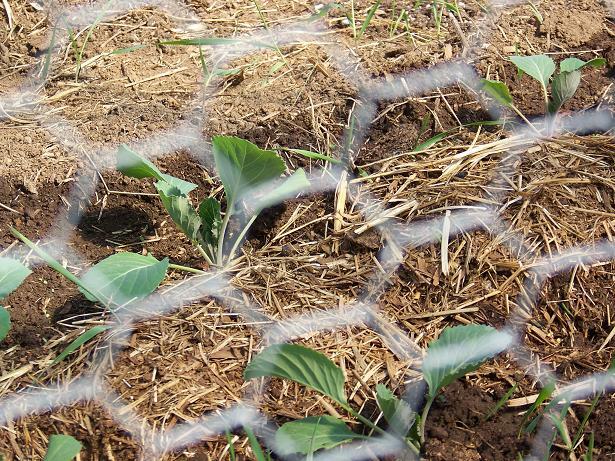 The chicken wire also helps make your greenhouse more functional and multi-purpose. We have ducklings in ours right now. No bobcats here but we have a fox issue. So far they haven’t bothered the chicken wire but they helped themselves to a duck. Probably just as annoying as bobcats – no fun in close places! I found a dead fox kit at the bottom of the hill. Looks like something got the better of it. Still, kind of a pretty animal. A fur coat in Julie’s future? Maybe a glove…but it’s all torn up. Something opened it up to find the goodies. Maybe a coyote? I’m so thankful I found your website. We’re in the process of ordering a hoophouse and all these tips are so helpful. For instance, I planned on ours going north to south, just because of the space available, and I’m happy to see that it makes sense to do it that way. Also the chicken wire is so wise, because we have free-ranging chickens and I hadn’t thought about what an attractive destination our hoophouse would be for them. What kind of end doors do you have on yours? We like the end doors to be sliders on barn door track, and wide enough for any equipment you may want to drive through the door. I use a tractor, so the smallest door is 8′, and on one end we have two 6′ doors for an even wider opening. Nice. The slider is also nice in the snow, and you don’t have to worry about vegetation getting in the way during the growing season either. The doors are stick built, and covered with the leftover plastic from the roll for the greenhouse. 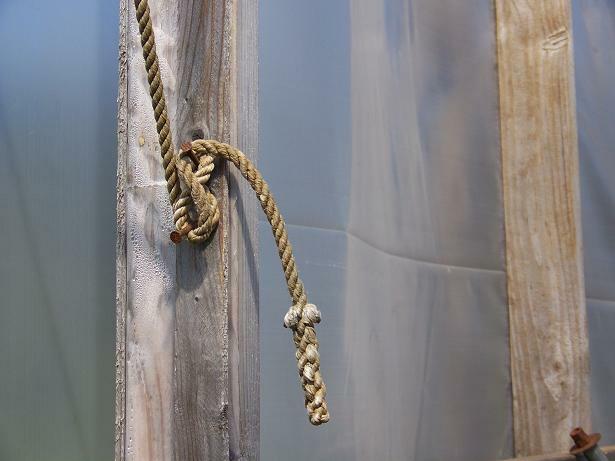 The doors are cheap to build, the money is in the barn door track, but it lasts a long time and could always be reused somewhere else. 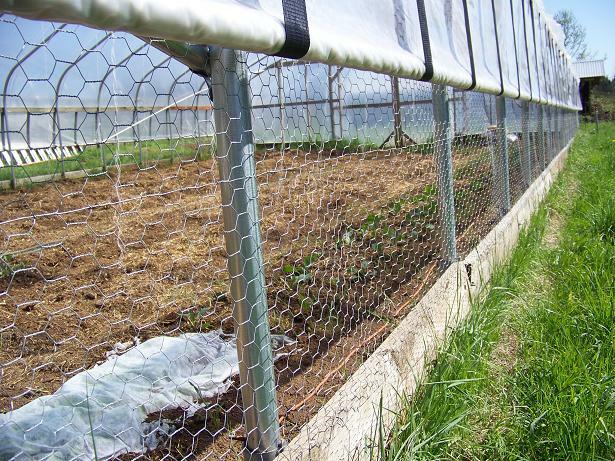 Bryan, check it out–chicken wire and low-tech ventilation ideas. Have you thought about adding “share” buttons on your site? It would be really hand to be able to share this on Facebook. Your right ventilation is the key to polytunnel growing, love the idea of chicken wire on the sides, keep out the pests but great for keeping poultry in. I hope you don’t mind another question on this post. 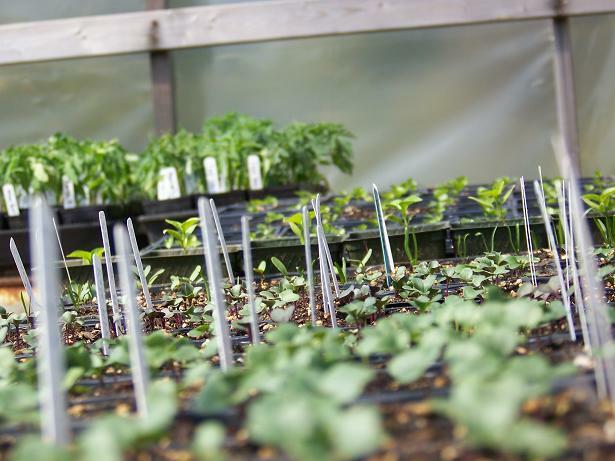 You mention that nighttimes will get too cold for the seedlings, in your hoop house: how do you keep them from getting nipped by the cold? Move them all inside? Amy, this post was written in late April, and if frost is imminent I’ll throw some row cover over the flats. In March when I start most of our first starts, I use bottom heat and another cover of greenhouse plastic tented up so it’s basically a greenhouse within a greenhouse. I don’t do any seed starting in the house, I wait until there is enough natural light to grow good seedlings. Nothing comes in the house ever.